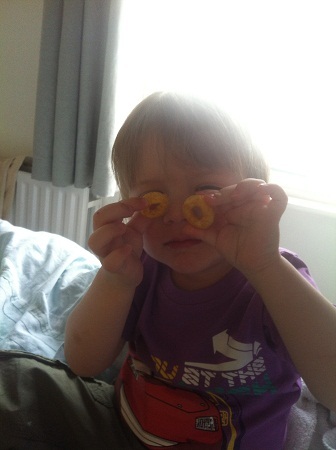 This weekend we got a little surprise of a packet of the new Walkers 'Hoops and Crosses' and they were accompanied by a cute Monkey - this worked brilliantly as Isla immediately claimed the monkey and Noah claimed the crisps. The packet lasted all of 3 minutes. We were sent Roast Beef flavour and I already knew that Isla wouldn't like them as she's not really adventurous with flavours - she is a cheese flavour crisp fanatic. However before I knew it Noah was making his way through half the bag and I hadn't even had a go yet! We shared the rest and I really liked them and it was clear that he did too at the rate they were disappearing down his neck! My only comment would reflect the fact that most brands of crisps have a cheese variant and I think a cheesy flavour would be great in this range. We're looking forward to trying out the other flavours soon. I was sent a packet of Walkers Hoops and Crosses and a cuddly monkey for the purposes of this post. This is a sponsored review and all opinions are my own.